We offer you a simple choice. You can enjoy one of our business training courses at Strawberry Lodge, a fully modernised, 17th century South London training centre. Or we can bring the training direct to your workplace - we train across the UK and EU. Writing courses for non-native English speakers. How many training courses are truly tailored to the needs of local government employees? How many take into account that each local authority is different and may require a different kind of training? Our ‘Writing for local government’ course is one of the few that allows for these differences. We let you specify what aspects of local government writing you want us to address and at what level you want us to pitch the training. If you wish, we’ll tailor the entire course around examples of writing produced by your local authority. To learn more, visit: Writing for local government. And still on the subject of tailored courses for local government, if writing reports is an issue for you, we now have a workshop dedicated to this topic. More details at: Report writing for local government. In many international organisations English has become the main language of communication. Though most copywriters in these organisations do not have English as their first language, their standard of writing can be high. However, many lack confidence because they have not been trained in the basic techniques of effective English copywriting. Our workshop aims to put this right. It provides a wealth of practical copywriting advice for non-native speakers. We also run a specialist course for non-native speakers of English who blog or are planning to launch a blog. Visit: Blogging in English, for non-native speakers. In addition, we have recently launched a highly specialised workshop for those who have to write for people across the European Union. Find out more at: Communicating with EU citizens. If you’re looking to attract extra visitors to your website, adding a well-written, weekly blog could be a great move. But not everyone has the time to write regular blog posts. Our newly launched, low-cost Strawberry Blog Writing Service could be the answer. Why not let our team of professional bloggers and journalists write your blog for you? Tell them everything you can about your company, your customers and your key messages, and they will do the rest. Among the many business writing courses we run are three tailored workshops, designed for bloggers or those planning to start a blog. how to keep finding fresh topics to write about. This course gives you the tools to create a high quality, professional blog. Whether you're starting from scratch or refreshing an existing blog, you'll gain a host of practical tips you can use immediately. Take a look at: How to write more effective blogs. This tailored workshop on blogging is one of the few in the world to focus specifically on the travel industry. Delivered by an experienced travel industry blogger, it provides answers to all the questions you might ask if you write a blog for that sector or are thinking of launching such a blog. Learn more at: Blogging for the travel industry. If you work in PR or corporate communications, you may want to check out our tailored workshop on ghost writing blogs. This is a highly specialised training course designed for anyone who has to write a blog on behalf of a client or a senior colleague. Full details at: How to ghost write a blog. If you're looking for fresh techniques to give your copywriting an extra edge, you'll welcome our fully customised course, Professional copywriting plus. It’s still packed with all the proven skill-building exercises and practical copywriting tips that have made it a success with hundreds of people both in the UK and abroad. But now it covers an even wider range of copywriting tasks. And we’ve added extra features to make your life as a copywriter even easier. For more details please see our course description. If you tend to put off writing business reports because you find the process difficult, here's something you'll welcome. We have a new workshop that's been designed to remove all the pain from business report writing. It’s called Professional report writing plus. It's unique in combining expert report writing tips with powerful techniques used by professional copywriters. The result is a highly interactive, one-day course that shows you exactly how to write reports for business - quickly and effectively. You'll find all the details in our course description. We have launched a unique one-day workshop. It's called: Writing web content for young people. Research suggests no other business training school in the world offers a course dedicated to this highly specialised subject. This workshop will be welcomed by the growing number of charities, local authorities, government bodies and major private sector organisations looking to communicate with young people through the internet. This course can be completely customised. Tell us the aims of your site and the age range of the people who read it and we will tailor our course content to your needs. If you are interested in writing for younger web users - children, teenagers or even young adults - please take a look at our course description. Do you edit a charity newsletter? If you write or edit a charity newsletter, you face a challenging task. You must produce a professional publication within a tight budget, all the while serving the best interests of your charity and the cause it supports. Our tutor, himself the former editor of a major national charity magazine, shows you how it’s done. In this highly tailored, one-day course he provides scores of essential tips to help you rise to the challenge. Check out: How to write a charity newsletter. There are few things more frustrating than finding yourself on an unsuitable course. At Strawberry Training we make every effort to prevent this happening by offering tailor made business training. Before each course we talk to those attending to understand their skill levels and the challenges they face in their work. If appropriate, we also speak to their line managers. We then design a course to fit. In this way the element of risk is removed. Our clients know that each of our courses will be packed with practical hints and tips tailored to their needs. For more about our business training courses, including our tailored writing courses, or to arrange a visit to our historic South London training centre, please call us now on: 020 8773 4718. Below we've provided links to other pages on the Strawberry Training website. You'll find information about our complete range of bespoke business training services. In addition, you can read about our historic training centre, Strawberry Lodge. 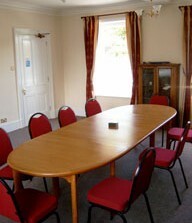 Based in Carshalton, Surrey, this centre is also available as an inexpensive-to-hire conference venue. If you are unable to find what you are looking for, please give us a call. A full list of the subjects we cover in our business training courses. Each can be tailored to your needs. To learn more about our bespoke management training courses call 020 8773 4718. Tell us about your website and the issues you face when writing for it and we will tailor our Website Copywriting course to your needs. Call 020 8773 4718 to book a course with Strawberry Training, a UK training provider offering customised courses for business and government.